To be honest with ourselves most pictures we take are just simply mediocre. And what I mean is that most pictures we take are just a push of that little button sitting on your top right side of your camera. Let’s just face it; most of us don’t even look in to the eyepiece of that green paper box covered disposable camera longer than 2 seconds. And as a result, we get mediocre or average photographs with very little thought involved. #1. Clean That Lens People! A smudge here, some dust and crumbs there… Who cares, right? Heck, because most cameras people buy today are so small, they carry them in their dirty crumby purses, book bags or pockets. Camera maintenance, specifically lens cleaning, is essential to taking great photographs. Have you ever seen a photo on a magazine cover with dust or those little fibers all over the cover? No. Have you ever seen dust on a photograph on a self respecting website? Probably not. So why is it all over every photo you take? You’re probably asking, “Why is this guy tripping over dust on my lens? It’s not like I’m going to take a photo that is going to be featured in a magazine?” Well, if you want your photos to become GREAT photos, clean that lens dude and stop asking silly questions. #2. Who turned off the light? Enough light is crucial to taking really great photos. You see, that little camera you own feeds off of light. Even the word Photograph means: To write with light. So if you have poor light, your photographs will be poorly written or come out underexposed. The opposite is also true. If you have too much light (like the abuse of your flash) your pictures will come out too bright or overexposed. The really great photos have a balance of light. I will go in to how lighting affects your photos and how it relates to some of your camera settings in another article, but I’ve found that outside natural light is one of the best light sources you’ll find. To get great photos, try shooting outside with your back to the sun with out a flash. Experiment with an ISO range from 100 to 400 for optimum results. #3. The rule of thirds. When you watch your next movie (try “The Lord of the Rings”), pay attention where Frodo or the landscape in the film is positioned relative to the framing of your TV. You’ll notice that the cameraman positions the person a little to the left or right. Or that lake scene has the lake at the bottom of the TV while the mountains and forest are at the top of the TV. This is the rule of thirds. The rule states that an image can be divided into nine equal parts by two equally-spaced horizontal lines and two equally-spaced vertical lines. The four points formed by the intersections of these lines can be used to align features in the photograph. For an example, look at the photo I took in South Africa below. 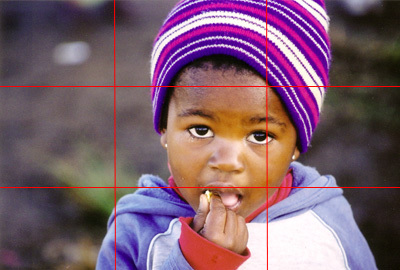 I’ve drawn a simple grid to show you how the rule of thirds works. You will notice that the little girl I took is positioned to the right side of the photo with the girl aligned to the two right intersections. Believe it or not it creates a more intense, natural and interesting photo then just putting the person in the dead center of the photo would. The next photo you take try to use the rule of thirds, then take the subject in the middle of the frame. When you compare the two, you’ll see that the photo your took using the rule of thirds is a great photo.